One bite of savory fig stuffing served at a holiday feast and Justin Chamberlin knew he’d found his next cocktail inspiration. 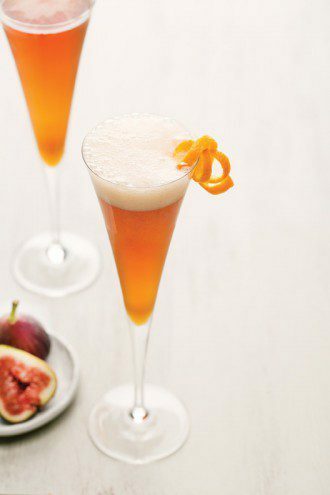 This Thanksgiving cocktail combines the subtle spices of aged rum with the sultry sweetness of figs and a bright pop of sparkling wine. 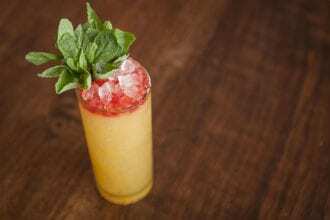 Combine all ingredients, except sparkling wine, and shake with ice to chill. Fine-strain into a chilled flute, top with sparkling wine and garnish. Fig and Brown Sugar Reduction: Combine 1 cup of water and 1 cup of brown sugar in a saucepan over medium-high heat and stir to dissolve sugar. Add ½ a cup of chopped fresh figs (Chamberlin uses Brown Turkeys, but feel free to substitute any variety), and bring to a boil. Cover, remove from heat and let steep for 25 minutes. Fine-strain into a glass bottle and refrigerate for up to 2 weeks. TIP: Can’t find fresh figs? Simply substitute dried figs and follow the recipe as directed. And if your holiday plans call for house guests, make a double batch of the fig reduction to have on hand for serving on pancakes, waffles and ice cream.